Just like an imaginative child, the author paints the world as he sees it - a red crocodile, an orange elephant, a purple fox, a black polar bear (!) and a polka-dotted donkey. Filled with colourful animals, this book celebrates imagination and the artist within us all. 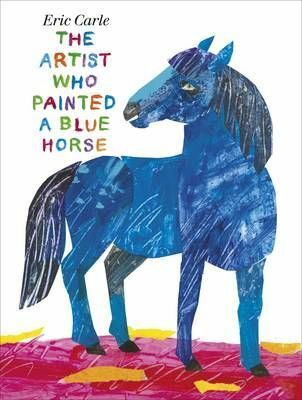 This is Eric Carle's wonderful new book, "The Artist Who Painted a Blue Horse". "I am an artist..." begins Eric Carle's vibrant tribute to the creative life. And just like an imaginative child, this is one artist who paints the world as he sees it - a red crocodile, an orange elephant, a purple fox, a black polar bear (!) and a wonderful polka-dotted donkey. Filled with some of the most magnificently colourful animals of Eric Carle's career, this is a book that celebrates imagination and the artist within us all. Inspired by the work of the great Expressionist painter Franz Marc, a founder of the artists' group known as Der Blaue Reiter ("The Blue Rider"), who famously used abstract blue horses in his paintings. Marc's vibrantly colourful paintings influenced generations of artists, and fired the imaginations of children's book artists far and wide. Examples of Marc's paintings and a short biography are included at the end of the book. Eric Carle is an internationally bestselling and award-winning author and illustrator of books for very young children. He was born in New York, but spent his early life in Germany.He returned to the States in his early twenties and worked as a graphic designer and an art director before he began creating children's books. He lives in Massachusetts with his wife, Barbara. The Carles opened The Eric Carle Museum of Picture Book Art in Massachusetts in 2002.